Calistoga is one of California's most beautiful places to plan your next Napa Valley bed and breakfast getaway. With its quiet small town feel and assortment of spas its no wonder Calistoga has become a hot spot for vacationers visiting the wine country. Now imagine yourself relaxing in your own romantic private cottage located in the heart of Calistoga's spa district. To have your own wood burning fireplace, your own cozy TV room, your own private place free from the interruptions of other people. Come to Cottage Grove Inn and stop imagining. 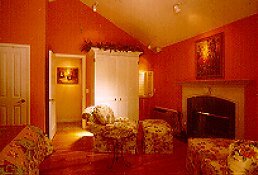 Here at Cottage Grove there are sixteen wonderful private cottages each individually decorated of themes ranging from Music to Rose Floral to Fly Fishing. Each cottage features a wood burning fireplace and ample firewood on your cottage porch, a stereo sound system, TV/VCR and a wet bar and refrigerator. Unwind in cozy comfortable reading chairs and at the end of the day, relax in your large bathroom complete with a deep jacuzzi soaking tub for two. In the morning a complimentary breakfast along, with the morning newspaper are served in the guest lounge. Dinner shouldn't be a problem with many fine restaurants within wakling distance of the inn, and of course many world-class restaurants throughout the Napa Valley. It's just a short walk to world famous spas where you can soak in a warn mineral pool indulge yourself with a massage, mud bath, facial or herbal wrap. Biking and horseback riding are also available nearby. Just around the corner you can enjoy a game of tennis on lighted public courts. Feel free to ask for your hosts assistance as they are knowledgeable about the many superb wineries located throughout the Napa Valley. The romance of the Calistoga area, the relaxation of its spas, the comfort of your own private cottage. What else do you need? Call Cottage Grove Inn to plan for your next getaway.